Which Countries Banned Gambling and Which Didn’t #Infographic ~ Visualistan '+g+"
Gambling is a popular entertainment for a lot of folks, and enjoyable when done sensibly. In reality, we've observed the fantastic Vegas casinos in several Hollywood films. Additionally, nowadays many internet casinos have popped up, supplying much easier access to this particular activity. But not every nation on the planet has the very same legislation to govern gambling. Some are far more restrictive than many others, moving even to the spans of banning this action entirely. 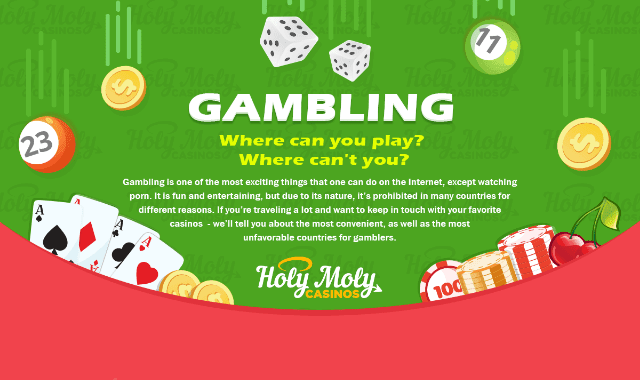 If you want to learn which nations have which legislation, then you need to check this infographic from Holy Moly Casinos. You may find that Israel has prohibited gaming and that it's set criminal penalties for people who do. Or that some different countries may enable physical and internet casinos, however, they need a license to guarantee they keep everything above board. For all these and a lot more unique details you only have to continue reading.